This is how to make Tempura Batter for Crispy Japanese Tempura Prawns and Tempura Vegetable. Learn how to fry Tempura Prawns. 8-10 Large Jumbo size Prawns – devein and make some cuts across shrimp belly. Press evenly with fingers to flatten it so that shrimp will be straight instead of curly. Prawns – Pull off the head if it is still attached. Pull off the outer shell. Keep the last segment of shell and the tail tip on. Devein the prawns. Make some slits across shrimp belly. Press evenly with fingers to flatten it as much as possible to prevent curling while frying. Clean prawns with running water and dry them on paper towels. Beat egg yolk gently and add iced water and ice cubes in a mixing bowl. Add sifted ingredients to the egg mixture in the mixing bowl. Mix batter lightly to a runny consistency. Start heating the oil in a frying pot. Check the oil temperature with chopsticks. Oil should be around 165C to 170C hot. When you see small bubbles around chopsticks, it’s pretty much perfect for deep frying. In a separate plate, add all purpose flour. Dust prawn in flour. Remove and dip in batter several times. Hold prawns by tail, in hot oil and jiggle, then let go. Start frying. 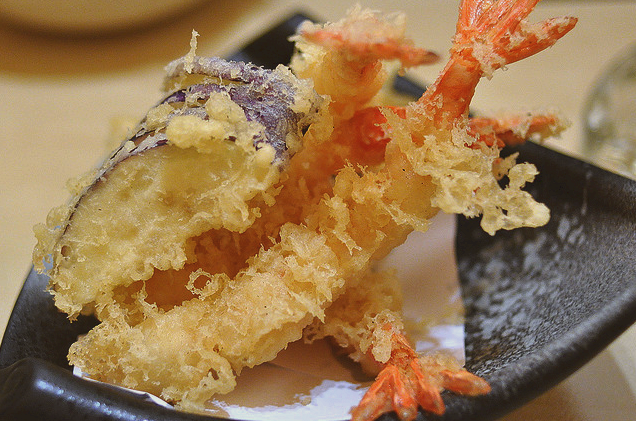 Drip some batter on the prawns using your fingers to the prawns to create the tempura crisp. Turn the tempura prawn and evenly cook. For vegetables, fry them a little bit longer. Serve while crisp and hot with teriyaki sauce. This recipe sounds amazing! Great post!I can’t wait to recreate it at home – thanks!